Resveratrol is the amazing compound behind the so called French Paradox. It is part of an interesting class of compounds called polyphenols, and you will be hearing quite a bit about it in the near future. Polyphenols are the new nutritional superstars of the antiaging world. They are a class of compounds having antioxidant properties, and a number of additional health benefits. Science is just starting to understand them and the positive role they play in human nutrition. Found in fruits and vegetables, they constitute a natural source of protection from a number of chronic health conditions, such as heart disease and cancer. They are part of what you might call nature’s medicine chest. Resveratrol is a polyphenol, which is naturally created by certain vines, plants, trees, peanuts and grapes. It has many interesting effects on the body, which work to increase health and longevity. It is thought to be part of the French Paradox, whereby the French people consume a lot of saturated fat, but do not have high rates of heart disease. It helps prevent heart disease due to its ability to protect the blood vessels against damage from LDL oxidation. In addition, it is the only natural substance that has been shown to actually activate a same “sirtuin (SIR)” genes as calorie restriction, which has been shown in experiments to extend lifespan by as much as 70% in yeast, flies, and worms. Whether this carries over to humans is another question, but the results thus far in laboratory experiments have been encouraging, and of course there is the undeniable affect of the French Paradox, which seems to indicate that something is working. There are indications from experiments that polyphenols can positively affect insulin control, by raising insulin sensitivity. This would also help explain its longevity increasing effects, as lower insulin levels correlate to a longer and healthier life. Resveratrol is the first natural product to have proven ability to inhibit cancer. It has a host of amazing properties and effects which make it an excellent choice to include in a cancer treatment regimen. The effectiveness of resveratrol to both prevent and treat cancer lies in its ability to affect on the cancerous cells and not healthy ones. It antioxidant action does not just protect you against free radicals as in the French Paradox, but also activates and deactivates genes, enzymes, hormones, and chemicals. Resveratrol is made by grapes and other plants in reaction to fungal infection, and thus organically grown grapes have the highest amounts because they are not sprayed with pesticides and so produce more of the substance. If you enjoy red wine, then be sure it is of good quality and that it is produced from organically grown grapes. Though this is still being studied, some experts feel that despite the French Paradox, there is not enough of this substance in red wine to give you significant benefits, and that the supplement form is your best bet for getting the best results for antiaging purposes. Wine extract standardized to pharmaceutical grade ensures the highest content of polyphenols for your antiaging needs. 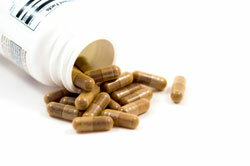 The brand that I would recommend would be Life Extension supplements, as they are produced to exacting standards. Reserve-Age is the brand I use on a daily basis, so you know that I really trust their product. Resveratrol is not a cure all, but it has a long list of positives and some good research behind it. I don’t think you can go wrong adding it to your nutritional supplement program.